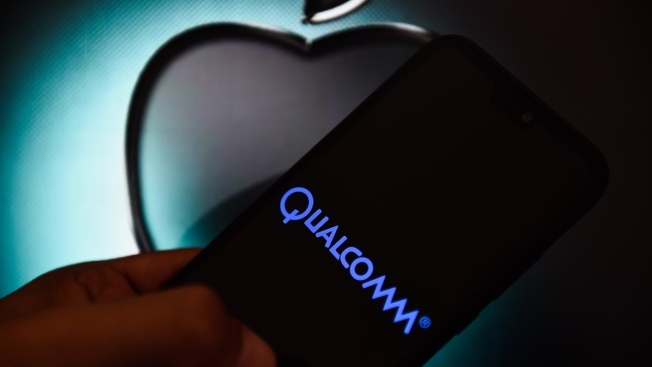 In this photo illustration a Qualcomm logo seen displayed on a smart phone with Apple logo on the background. Qualcomm stock rose more than 20% after the news broke, boosting its market cap by about $14.5 billion to to more than $84 billion. It’s Qualcomm’s best day since 1999. Apple was up less than 1%. Intel, a Qualcomm competitor, sharply dipped on the news before recovering. The complicated legal battle, centered around modem chips and related disputes, has been raging in courts around the world for the past two years, including an earlier trial between Qualcomm and the U.S. Federal Trade Commission. According to Qualcomm, the new license between the two companies is six years, with a two-year option to extend. It includes a one-time payment from Apple to Qualcomm. The amount of the payment was not disclosed. New iPhone models released in 2018 used Intel modem chips instead of Qualcomm’s technology. Analysts had previously said that the dispute between Qualcomm and Apple could slow down Apple’s plans to support next-generation 5G networks. Qualcomm is one of the top suppliers of chips that can connect to 5G networks. The agreement opens up the possibility that Apple could release a 5G iPhone sooner than expected with Qualcomm’s modem technology.